The Pride-Of-Barbados Becomes The Pride-Of-Texas! and SEARCH for "Pride of Barbados". The Pride-Of-Barbados has long been a favorite for hot tropical landscapes where it provides a fiesta of vibrant color throughout the year. Even botanists recognized this plant’s beauty as the word “pulcherrima” in the scientific name, Caesalpinia pulcherrima, means very pretty. This Caribbean native celebrates the warm summer season, hitting its stride in flowering during the toughest part of summer when most of our color plants are languishing in the dog-day sun. Some of the alternate common names, such as flame tree, peacock flower, and flowering fence hint at its showy nature. Spectacular terminal racemes up to 20 in. long begin to appear in spring in south Texas, during summer in central and north Texas. Individual flowers open progressively from the base of the raceme to the tip with the longest pedicles on the lower flowers, giving the raceme a cone or pyramidal-shaped outline. Racemes last for an extended time as the individual florets sequentially open up the stem. Florets are 1½ to 2 in. wide with five showy red to orange, occasionally yellow, petals arranged like a shallow cup with bright red stamens extending 2 in. beyond the petals. Cool looking waxy lima bean-shaped 3 to 6 in. long pods follow the flowers, starting green, flushing red, and eventually turning shiny brown. One can either enjoy the fruit development or deadhead the spent flowers to hasten the next flush of blooms. As if the flowers were not showy enough on their own, nature has made them attractive to hummingbirds and butterflies which add movement and excitement to the summer spectacle. Even when not in bloom, the foliage of Pride-Of-Barbados is interesting, offering soft textured very finely divided broad bipinnately compound leaves 8 to 15 in. long. The numerous fine textured lush dark green to blue-green leaflets contrast well with the coarse branching pattern of its shrubby growth habit and the intricate red, orange, and yellow flowers. Some of the select seed lines with strongly blue-green foliage are even more handsome than the species type. Growth habits and uses vary by region of the state. Pride-Of-Barbados is sometimes planted as a barrier hedge as some of the older stems develop stiff prickles, hence its use in the tropics as a showy natural fence. Along the Gulf Coast and in south Texas, Pride-Of-Barbados can be used as a semi-evergreen hedge or limbed up as a small tree. A bit further north in El Paso, Austin, College Station, and Houston it may serve as a herbaceous perennial returning from the roots after mild winters. For the rest of the state it makes an outstanding annual summer accent, providing flowers during the hottest part of the year. Pride-Of-Barbados makes a great summer replacement for transition season plantings or can add spicy colors to mixed or single species patio or dooryard pots. Culture is easy as all one needs is a sunny spot with about any well drained soil. For nurserymen, the key to good growth is to start plants as soon as possible in a warm greenhouse as plants grow rapidly, but languish in cool temperatures. Also, avoid over-watering to reduce the potential for root rots. 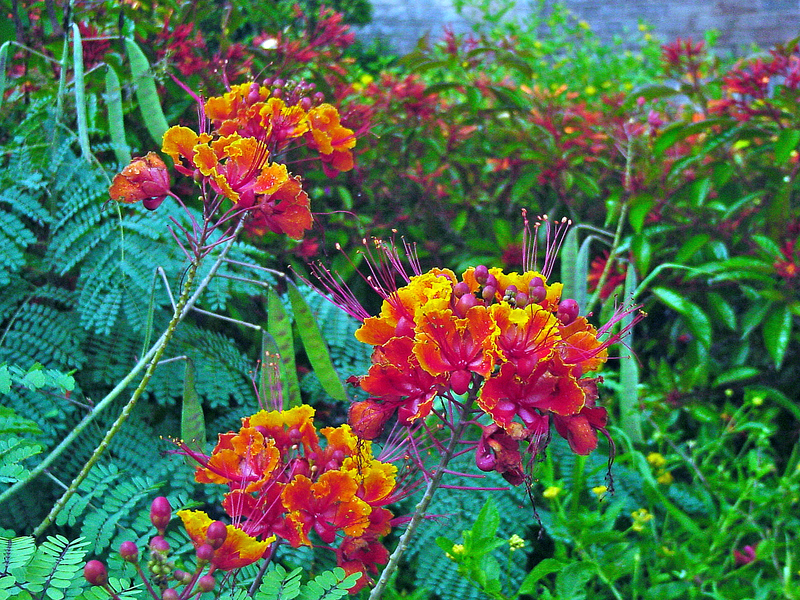 Pride of Barbados, Caesalpinia pulcherrima is a member of the pea family (Fabaceae). 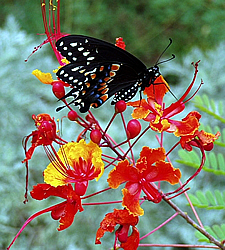 It is referred to by other names including Barbados Flowerfence, Peacock Flower, Mexican Bird of Paradise, Dwarf Flamboyan, Caesalpinia, and Dwarf Poinciana. The species name pulcherrima literally means "very pretty" and this plant definitely lives up to the name. The blooms of Pride of Barbados are incredible with terminal flower clusters showing an orange-red with a tinge of gold on the edges. Each flower is composed of five showy petals with very prominent six inch long red stamens. 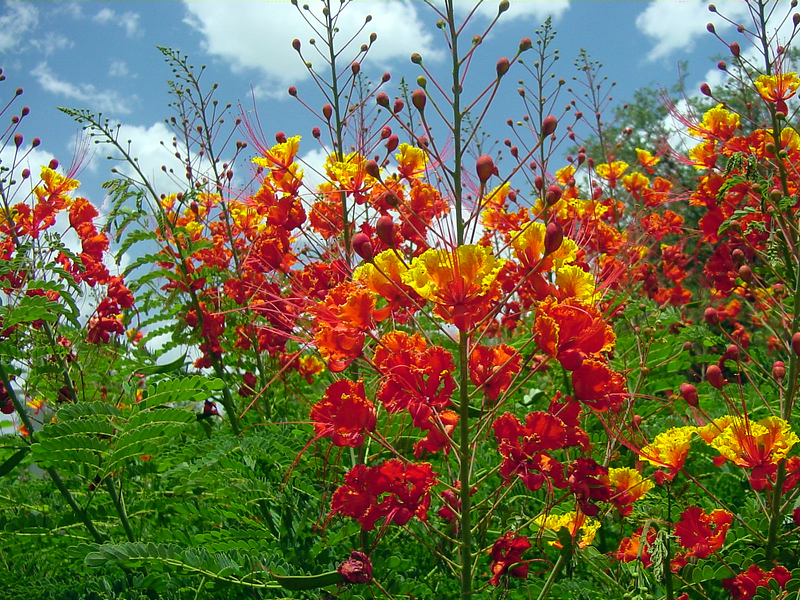 This makes the Pride of Barbados one of the most attractive heat loving plants for San Antonio! Pride of Barbados is an evergreen shrub or small tree in frost free climates, a deciduous shrub in zone 9, and a returning perennial in zone 8. In the tropics it gets 15-20' tall and its ungainly, wide spreading branches can cover about the same width. 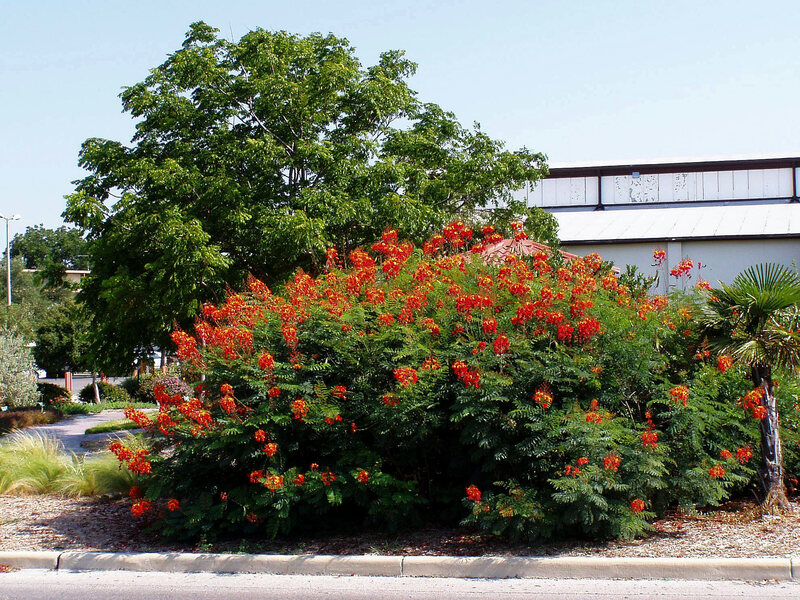 The cultivation of Pride of Barbados in San Antonio is usually a semi-dwarfed hardy perennial shrub to a typical size of 5-8' tall and growing that large even after freezing to the ground the previous winter. The stem, branches and petioles are armed with sharp spines and the leaves are fernlike and twice compound, with many small, oval leaflets. Pride of Barbados flower lives up to its name with incredibly showy blossoms of orange and red. The flowers are bowl shaped, 2-3" across, with five crinkled, unequal red and orange petals, and ten prominent bright red stamens that extend way beyond the corolla. The flowers are borne in terminal clusters 8-10" tall throughout most of the year in tropical climates and in late summer and fall where frosts occur. There also are forms with yellow and forms with dark red flowers. The fruits, typical legumes, are flat, 3-4" long, and when ripe they split open noisily to expose the little brown beans. 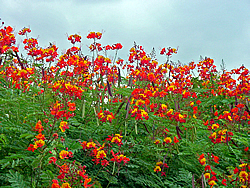 Pride of Barbados is believed to be native to the West Indies and tropical America. It is widely cultivated and has escaped cultivation and become established in tropical regions throughout the world, including South Florida. 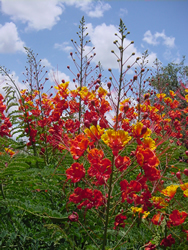 The selection of Pride of Barbados that we desire here in San Antonio is a smaller dwarf compact selection named Dwarf Poinciana, Pride of Barbados. Local collaboration of regional propagation sources will be increasing adequate numbers of available plant material in the next two years. 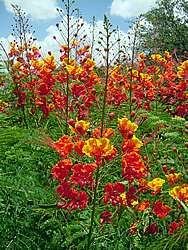 Once suitable numbers become available, the Pride of Barbados selection of the Dwarf Poinciana plant will be officially release in the spring of 2008 as a Texas SuperStar plant. It obviously meets all the criteria of a Texas SuperStar Plant. 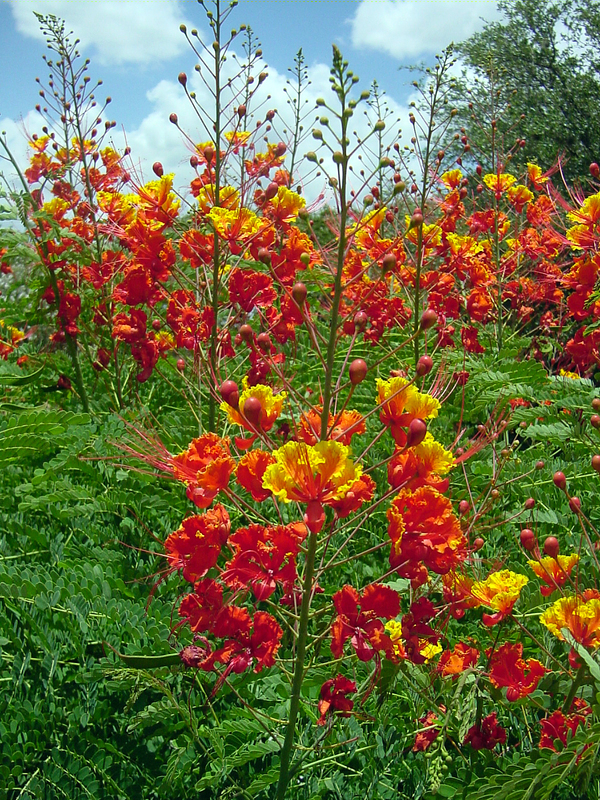 Pride of Barbados is very easy to grow in alkaline to acidic, well-drained soils. This is a fast growing, but short lived plant. It is moderately tolerant of salty conditions. 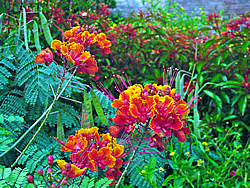 Pride of Barbados flowers benefit from pruning, and can be shaped to tree form or shrubby bush form. These plants prefer full sun to partial shade. Pride of Barbados flowers bloom best in full sun. 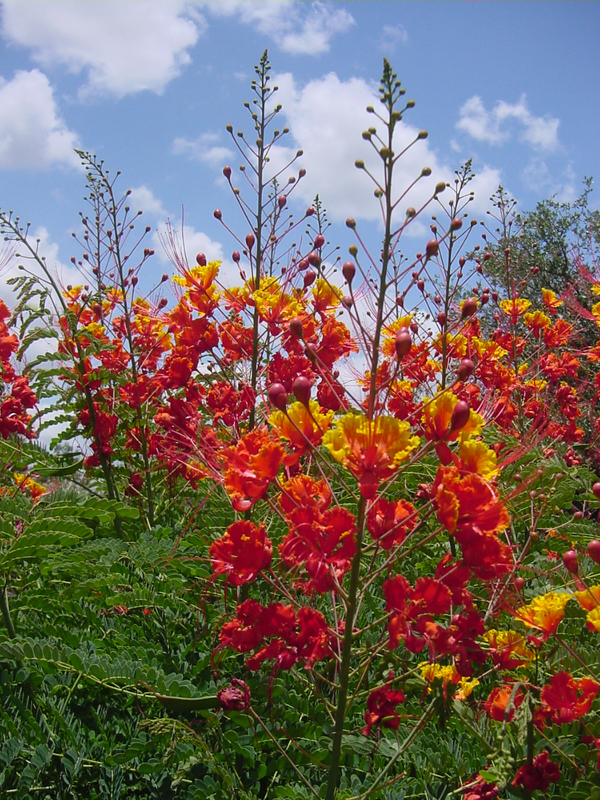 Also, Pride of Barbados is considered drought tolerant once established. Within the USDA Zones of 8 – 11, Pride of Barbados dies to the ground following frost or freezing temperatures, but in zone 8B, at least, it comes back reliable, albeit late, in middle spring. Don't give up on it! Pride of Barbados has survived temperatures as low as 18 F. It can be grown as an annual in colder climates. Even under frost free conditions, Pride of Barbados may lose its leaves when temperatures drop into the 40's. Pride of Barbados is easy to start from seeds. Germination will be speeded up if the seeds are nicked with a file before planting. Under good growing conditions, Pride of Barbados will self sow and may even become weedy. 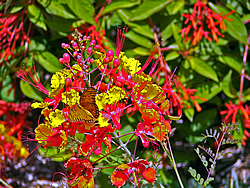 The striking orange red flowers are an attention grabber and butterflies love them! Use Pride of Barbados as a specimen or in a mixed shrub border. It has an open, spreading habit and the branches sometimes get too long for their own good and break off. 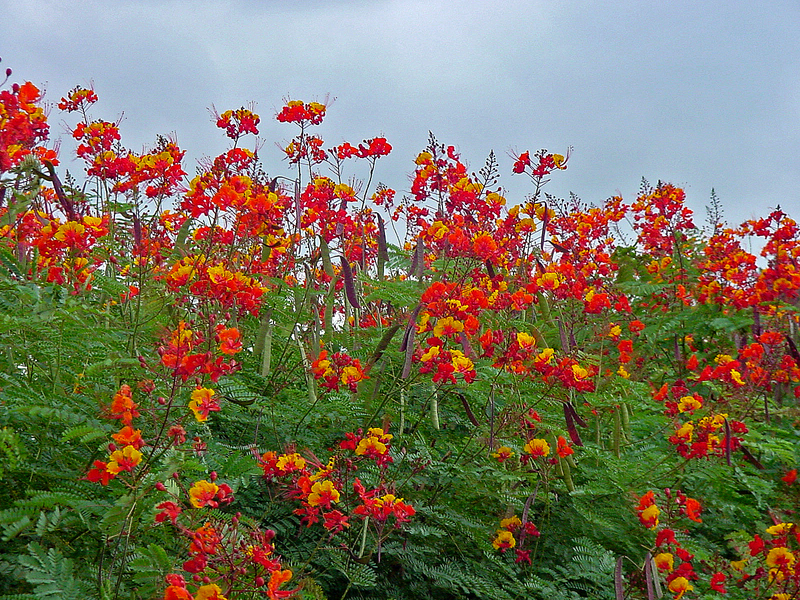 Still, a row of Pride of Barbados makes a showy, fine-textured screen or informal hedge. 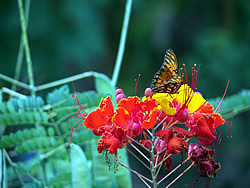 You can cut Pride of Barbados to the ground in late winter or early spring to get a bushier, more compact shrub. 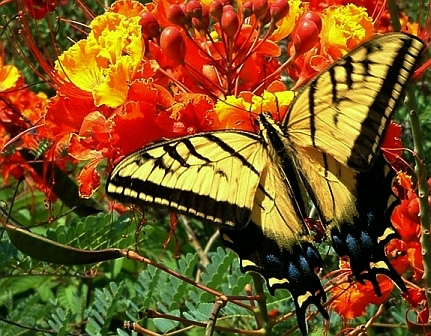 There are some 70 species of Caesalpinia in tropical regions worldwide. They were formerly placed in the genus Poinciana, but that genus name is no longer used. We all can't grow the tropical, Royal Poinciana (Delonix regia), considered to be the most beautiful tree in the world, but for gardeners in zones 8 and 9, the selection of Pride of Barbados (a.k.a. Dwarf Poinciana) is a close second and for sure a number one future Texas SuperStar winner here for San Antonio. 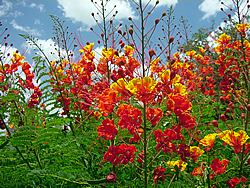 Question: What is the difference in the Pride of Barbados and Mexican Bird of Paradise? All pictures that I can find look like they are the same plant and flower. 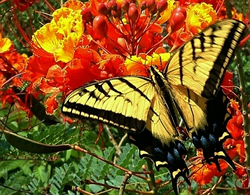 The Mexican Bird of Paradise (Caesalpinia mexicana) is a larger shrub with yellow flowers like those shown at http://www.magnoliagardensnursery.com/productdescrip/Caesal_Mex.html. The problem comes because many refer to the C. pulcherrima as the Red Mexican Bird of Paradise. Question: I have two Pride of Barbados plants in my yard. Nearly everything else in the garden has leafed or budded out, but not the "Prides." Should they have by now? 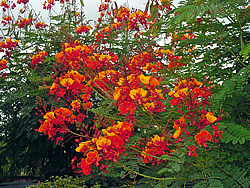 Answer: The Pride of Barbados (Caesalpinia pulcherrima) is slow to return. Yours may or may not have frozen to the ground. If so you can go ahead and cut it back, and it should return from its roots. If, however, the stem is still green when you scratch the bark, just be patient. Question: There are lots of seed pods on my Pride of Barbados. Can I use these to propagate new plants and if so, how? Should they be removed from the plants? Answer: Yes you can grow plants from the seed. For the Pride of Barbados, you pick the seed pods from the plant and put them in a brown paper sack and put them in the garage or some such place to let them dry. They will pop open and spill their seed. You can plant them either in containers or in the ground where you want them to grow about ½ inch deep in moist soil. Keep soil moist but do not saturate. Answer: I recommend that you wait until after the first freeze and then cut the Pride of Barbados (Caesalpinia pulcherrima) back to the ground. If it doesn't freeze then cut it back to about 6 inches in mid February. Question: Will deer eat Pride of Barbados? Question: I recently bought a Pride of Barbados Tree. I had tried to grow it from seed, no luck. My question is: In my area of Northeast Texas (near Tyler), should I put it in a container and bring it in in the winter or plant it in the grown and leave it. And should it be in full sun. I have wanted this plant for a long time and want to give it the best care. Answer: To be sure that it will survive the winter I recommend that you keep it in a container. It should be fine for several years in a container about the size of a 5 gallon black nursery container. It will bloom best in full sun but will do quite well with morning sun. You should bring it into a protected location when freezing temperatures are forecast. Question: I have been working on getting Caesalpina liners to sell for next spring. The variety that I thought was the smaller, early summer blooming variety was the 'pulcherrima'. This week though I saw some that the grower had bought seed marked pulcherrima that grew 7 feet tall and didn't bloom until early Fall. What can you tell me on this? C. pulcherrima (Pride of Barbados, Red Bird of Paradise, Dwarf Poinciana) is the showy one we grew at Lone Star Growers in San Antonio, you tested acid scarification on at Petersons, and I had in my yard in San Antonio (Seale Rd...). Showy BRIGHT red/orange/yellow flowers. It can get seven feet tall but I have never seen it. Wait until fall to bloom. The more heat the faster the bloom. If frozen back, it will be slower to bloom. AS FAR AS "the grower who bought seed marked pulcherrima that grew 7 feet tall and didn't bloom until early Fall," either the grower got mislabelled seed or planted the seed in late spring. Most of the plants sold in the summer are seeded in January or February. 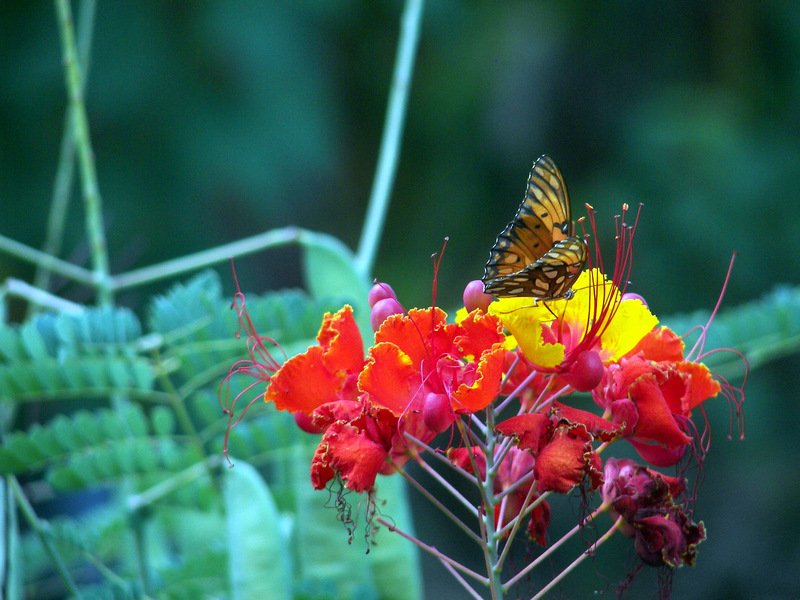 Question: Does Pride of Barbados attract hummingbirds? Answer: It is listed at: http://www.plantanswers.com/hummingbird_plants.htm as a hummingbird attractor. 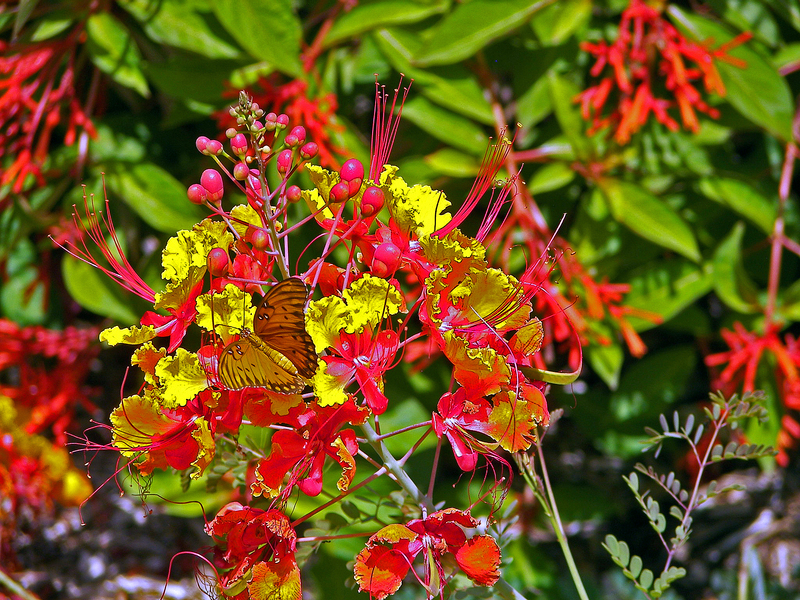 Calvin Finch writes: Poinciana, also known as Pride of Barbados, is even more popular with butterflies and hummingbirds than ‘Gold Star’ esperanza. 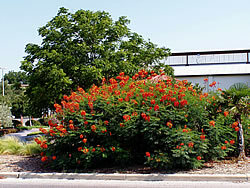 It has an airy, open growth pattern and glow-in-the-dark orange-red and yellow blooms. Like Yellow Bells, poinciana blooms without summer irrigation. The plant is not a favorite deer food but they will eat it to the ground in some situations. Calvin Finch also writes: Nothing makes a better show than poinciana and ‘Gold Star’ esperanza planted together. 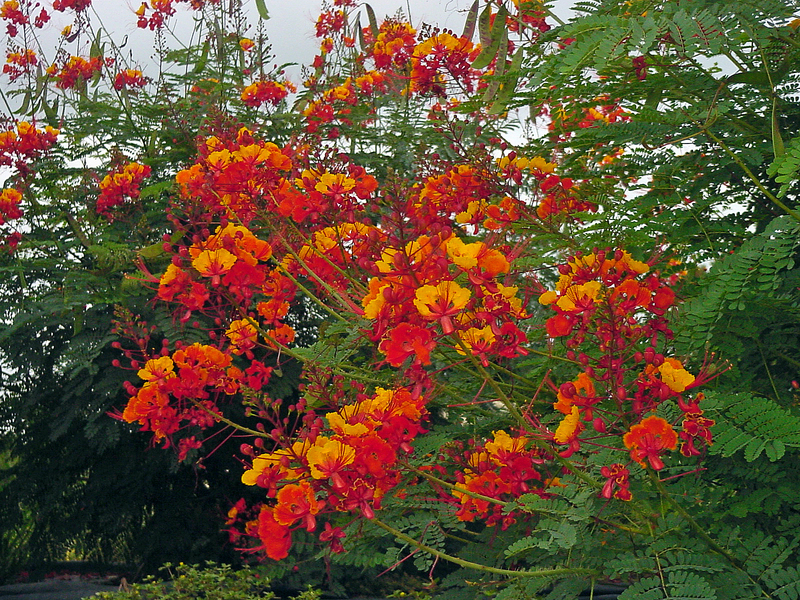 The poinciana (Pride of Barbados) freezes back every year and typically also reaches about 6 feet tall every summer. Its flowers are glow-in-the-dark orange. The butterflies and hummingbirds like poinciana and, unfortunately, so do the deer.